Helpful Kitchen Hacks II, for your homemade household. - Our Sunday Cafe, the Retirement Edition! Helpful Kitchen Hacks II, for your homemade household. I decided to make a herb vase to keep fresh herbs fresh for as long as possible. I grew tired of fresh (and expensive) herbs rotting within a couple of days of purchase. One reason this happens is that the paper and wire band does damage to the stems from the farm to the market and from there it is all downhill! Until I can grow parsley and cilantro in the garden, I need to purchase it at the co-op when a recipe calls for it. I like having fresh herbs on the counter, ready to use and use up. 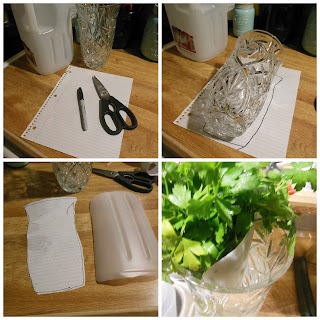 All you need is a flair top vase, an empty milk jug, a piece of paper, a sharpie and a pair of scissors. 1. Trace the outline of the vase on the paper, then cut it out. 2. 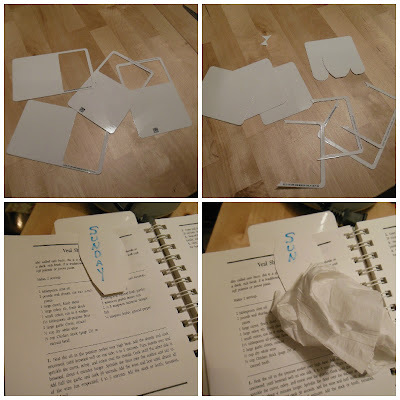 Cut the milk jug apart and keep a flat side piece, trace the cut out onto the plastic. 3. Cut out the shape traced on the plastic piece, cutting inside the lines. Test fit and trim as needed. 4. Fill vase with water, add the divider and fresh herbs. Unfortunately, the cilantro could not be saved, but this won't happen again! I use our grain mill to turn lentils into flour. If you wish, you can also make lentil flour in a coffee grinder kept for that purpose. Lentil flour is high in protein and fiber. It is also a great thickener for soup and stew in place of flour or cornstarch. To bake with lentil flour, simply place a spoonful into the bottom of the measuring cup when measuring flour for a recipe. Bake as the recipe directs you won't need new recipes. A spoonful in a cup of flour will not noticeably affect the finished product except to increase the nutritional value. You know those little frames left over when you punch our your insurance card? 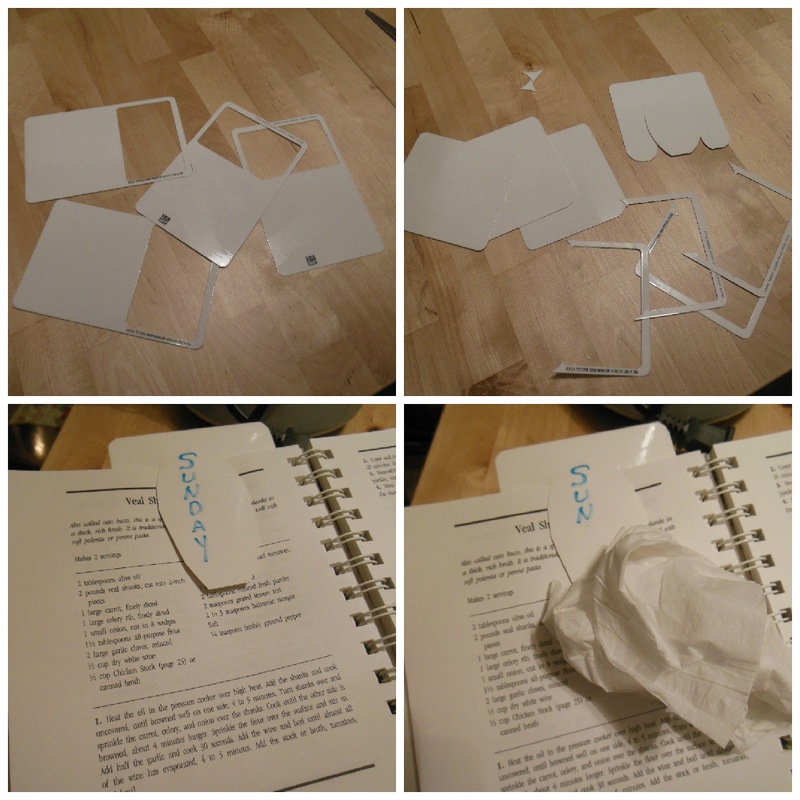 They make great dry wipe bookmarks, it is real easy, take a peek! 1. Cut off the portion where the insurance card was removed. 3. Dry wipe pens will write notes or labels as needed. 4. With the plastic coating, they clean up easy with a dry cloth or tissue. What kind of hacks do you use? I would love to hear about them. I saw your cilantro and came right over from the homemaking party. I loved your post today for sure. It has inspired me to try these ideas! Hugs to you new friend. Visit me at my blog any time! Hello Kirstee, I think your herb idea is wonderful. We are learning what will grown here and what the deer eat, so far I have been successful with Rosemary, Sage and Peppermint. I love that herb hack! I feel like I always have to fight with getting them in the water and not flopping all over. This is going to be featured on next week's Waste Less Wednesday. Thanks for sharing! Thank you, and thanks for featuring OurSundayCafe, I appreciate it! I love the herb vase! I also see suggestions about keeping a basil plant in your kitchen window but it's not really feasible for me but I think the vase would work! I'm definitely going to give that a try. Thanks, I too am not the best kitchen gardener, but this works for me. Love all these hacks, especially the divided vase. I just love your Kitchen Hacks, Melynda, they are super! Thanks so much for sharing this awesome post with us at Full Plate Thursday. Have a great week and hope to see you again real soon!